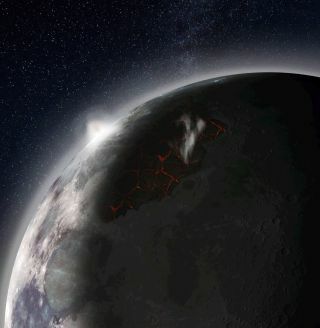 An artist's impression of Earth's moon shows lavas erupting, venting gases and producing a visible atmosphere. Earth's moon doesn't have much of an atmosphere today. However, it may have had a more prominent atmosphere 3 billion to 4 billion years ago, when volcanic eruptions spewed giant clouds of gas above the lunar surface, a new study has found. Today's moon is covered in dead volcanoes and dark maria, or plains that consist of hardened lava. The lunar atmosphere is so thin it's not even technically an atmosphere — instead, it's considered an "exosphere," with molecules that are gravitationally bound to the moon but are too sparse to behave like a gas. Samples of volcanic glasses collected by Apollo astronauts in the 1970s revealed that magma beneath the lunar surface billions of years ago "carried gas components, such as carbon monoxide, the ingredients for water, sulfur, and other volatile species," LPI officials said in a statement. In the new study, the researchers calculated how much gas rose from the lavas that flowed from the lunar volcanoes. They determined that enough gases accumulated around the moon to form an atmosphere, and that this atmosphere grew faster than it could escape into space. LPI officials said that the findings may have big implications for future exploration of the moon, because it "quantifies a source of volatiles that may have been trapped from the atmosphere into cold, permanently shadowed regions near the lunar poles and, thus, may provide a source of ice suitable for a sustained lunar exploration program." The study was published online Sept. 25 in the journal Earth and Planetary Science Letters.